The Milwaukee Brewers are close to etching a spot in the record books. In a year where the average team attempts 0.72 steals per game, they’re running 1.42 times per game. The closest the league’s ever come to that rate is 1987. That year, a combination of Vince Coleman, Harold Reynolds, and Willie Wilson tested the peripheral vision of pitchers and catchers league-wide. Were the season over today, their 197 index figure (where 100 is league average) would rank ninth-highest since 1951. It would be the highest since the 1992 version of the Brewers, for which Pat Listach attempted 72 steals. It would even edge the 1959 “Go-Go” Chicago White Sox, which featured Luis Aparicio’s 69 attempts in a low-steal era. *Stolen Base Attempts Index, where 100 is league average. With 66 attempts and counting, Jonathan Villar is driving the Brewers’ aggression on the basepaths. Villar joined the team last offseason after three forgettable years with the Astros. He switch-hit and teased fans with some power but struck out too much and walked too infrequently to be worth investing in. Plus, as a shortstop/third baseman on the same team as Carlos Correa, Luis Valbuena, and Alex Bregman, his days in the Bayou City were numbered. After the 2015 season, Villar was trade bait. Thankfully for him, his former assistant GM in Houston was now the GM in Milwaukee. David Stearns snapped up Villar and sent his own shortstop, Jean Segura, to the Diamondbacks a few months later. Villar responded to the trade with seeming vigor. He cut down on his swing rate and laid off more pitches out of the strike zone than ever before. As a result, his walk rate shot up to 11.3%, in range with Correa, Anthony Rizzo, Brian McCann, and Kris Bryant. 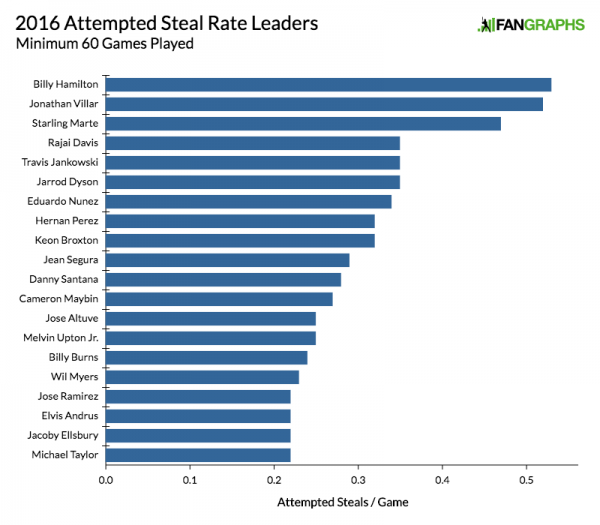 But while Hamilton has Brandon Phillips (15 attempts) Jose Peraza (16 attempts) for teammates, Villar has Hernan Perez (30 attempts) and Keon Broxton (20 attempts) backing him up. Heck, even Ryan Braun has 17 attempts. That’s how you run your team into the history books. As Jeff Sullivan noted earlier this week, Perez is a curiosity. A mid-2015 waiver claim from Detroit who was let go by (and then re-signed with) the Brewers, his .305 OBP limits the damage he can do on the bases. But his 30 attempts in 95 games this year far outweigh his eight attempts in 66 games with Detroit. I don’t know how aggressive Broxton was in Pittsburgh last year, because he played only seven games there. I do know in those games he ran twice, while in Milwaukee he’s run 20 times in 62 games. Jeff has you covered on Broxton’s other improvements this year. Because manager Craig Counsell doesn’t seem inclined to aggression on the bases, I wonder if new first-base coach Carlos Subero is urging these guys to run more often. Perhaps he’s better than his predecessor Mike Guerrero at noticing tells in pitchers’ deliveries, advising his base-runners on when to bolt, or both, leading to more trust from Counsell. Or perhaps it’s simpler than that: maybe Counsell is now armed with speedsters he didn’t have before. I’m not sure. Whatever it is, this new arrangement is working. Among players with at least 100 PA Perez, Broxton, and Villar rank third, fourth, and fifth with +3.4, +3.3. and +3.1 weighted stolen-base runs, respectively. Combined, their team is second in baseball with +9 wSB runs. Some people complain that stolen-base rates are down from their peak in the 70s and 80s. I have two things to say to them. First: be glad you’re not watching 1950s baseball. 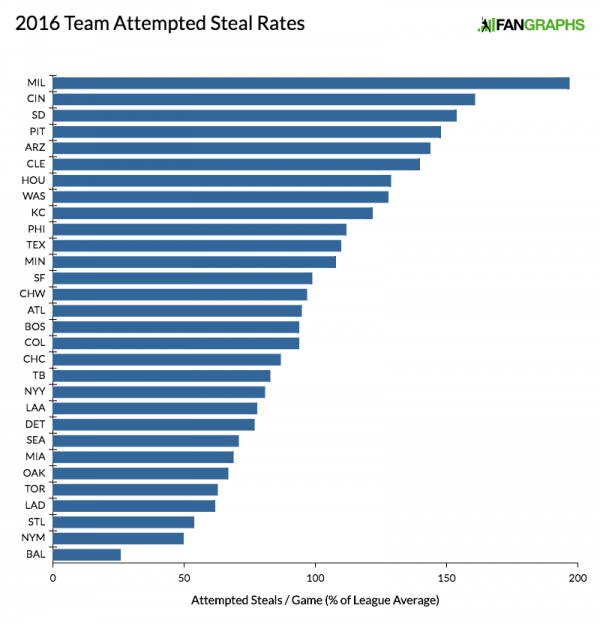 Teams then attempted steals 23% less often than teams today. Second: buy MLB.tv and flip on a Brewers game. You can pretend it’s 1987 from now until October 2nd. We hoped you liked reading The Go-Go Brewers Are Stealing Bases Like It’s 1987 by Ryan Pollack! I loved the 1988 video game MLB for Nintendo. The player stats/ability was based on the 1987 season. That 1987 season seems a lot like 2016 as far as the uptick in homers are concerned. Was the baseball altered or changed that season? That 1987 season averaged 1.06 HR per game. That was MLB most ever to that point. From 1871-1987. 2016 is at the 2nd highest clip ever (1.16), only the year 2000 averaged more (1.17).